Ever wonder what coins cost more than they’re really worth? Or what coins are true bargains these days? This is something I think about whenever I buy coins. The answers to these questions will almost always vary based upon who you talk to. But the results of this survey below from International Precious Metals helps shed some light on these burning questions about coin values. 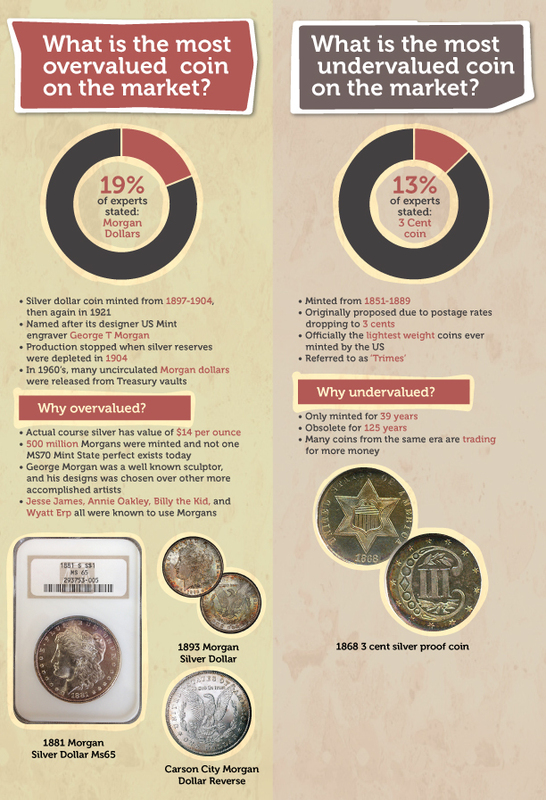 According to the results of the poll, 19 percent of the numismatic experts surveyed said the most overvalued coin on the market is the Morgan dollar, which was minted from 1878 through 1921. It’s a coin we see in just about every coin-related magazine or newspaper ad, and they’re usually touted as “last chance,” “just discovered in vault,” or “silver rarity” specials. Now, if you know anything about Morgan dollars, you’re pretty well aware that there are millions of Morgan silver dollars floating around out there. So, they’re definitely not categorically “rare” coins – though there are some dates that are extraordinarily rare, and the prices of those valuable key-date Morgan dollars can be in the thousands of dollars. For the record, I love Morgan dollars, which were designed by George T. Morgan and represent classic American coinage. I think every U.S. numismatist should have at least one Morgan dollar and their coin collection. And at a price of about $30 for a common-date mint state specimen, these old silver dollars are affordable additions to any coin collection. But, trust me, the Morgan dollars being offered in those alertist, "buy it now or else" ads are usually common dates that will be around in vast quantities for many years to come. So, what coin is the most undervalued? According to 13 percent of the coin professionals polled, the 3 Cent coin was the best buy. In my opinion, it’s pretty difficult to argue against that. 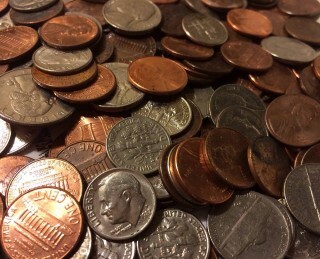 After all, relatively few people collect 3 Cent coins, and yet these old, scarce coins are often forgotten by many numismatists who collect more widely popular series such as Lincoln cents, Washington quarters, and – yes – the aforementioned Morgan silver dollars. Surely, if more coin collectors were to go out and buy the 3 Cent piece, we’d probably see prices for that coin escalate as increased demand places more pressure on the relatively scarce coin otherwise known as the "Trime." James B. Longacre, chief engraver of the United States Mint from 1844 through 1869, designed all 3 Cent coins. He’s the same individual who designed Indian Head pennies, Liberty Head double eagles, and Two Cent coins. 3 Cent pieces are true relics from a bygone era. Yet, they're still quite affordable. With prices ranging from $20 for a common nickel Three Cent coin in Fine to $50 for a common silver 3 Cent piece in the same grade, now may be the time to jump on buying representative type examples of each for your coin collection.